With one round left in the 2017/18 regular season, two Tigers teams are within touching distance of securing home semi-finals. The Jodie Fields Shield side, fresh off nailing down a spot in the top four last weekend, will take to Peter Burge Oval this Sunday in the first senior semi-final of 2018. The ladies will go into the match high on confidence despite losing their last regular season match to Gold Coast by eight wickets – their first defeat since the Christmas break. The Tigers managed just 92 batting first and had their total chased down by the opposition with eight wickets left in the shed. Delyse Laycock top scored with 13, while Jo Friske led the wicket-takers column with 2 scalps. First Grade will travel into the final round in fifth position following defeat to the University of Queensland in their last home game of the season. The visitors chased down Redlands’ 245 with two wickets in hand despite losing their first four wickets for 74. 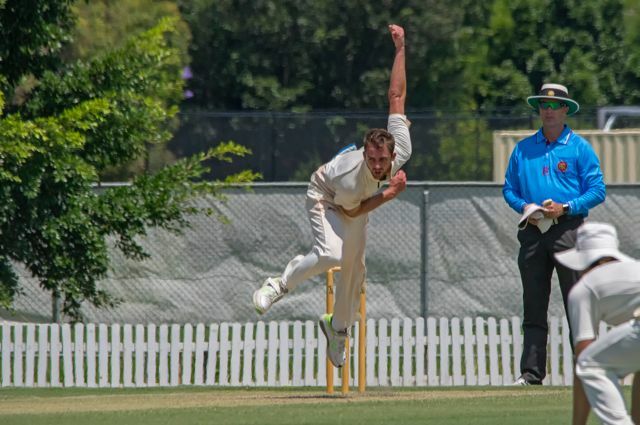 Jon Stimpson claimed three scalps, but both he and the Tigers bowlers were unable to take the final two wickets required for victory as UQ surpassed Redlands’ total in the 93rd over of the day’s play. Second Grade failed to defend their first-innings total of 301 declared against the University of Queensland in a tight affair away from home. Rob Ballarino (4/105) and skipper Craig Weier (3/72) did their best to put their side back in control during the dying stages of the game, and when the ninth wicket fell with the score on 289, Redlands found themselves in the box seat. But a last wicket stand saw UQ walk away with the points in a 103 over thriller. Third Grade batted for almost the entire second day to avoid outright defeat at the hands of the University of Queensland. After being bundled out for 45 in the first innings, the Tigers made amends in the second to post 254. Josh Fraser (93), Jimmy Carr (50) and Michael McEwan (41) led the resistance following a declaration from UQ with the score on 6/189. Fourth Grade were dismissed for 95 in response to the University of Queensland’s first innings total of 202 away from home. Klinton Goodridge (24), Matt Conwell (16) and Craig Holdsworth (16) were the only batsmen to make any headway in the first innings, while in the second, Scott McAuliffe (27) and Matt Conwell (22) helped the Tigers through to a total of 4/80 at stumps. Fifth Grade one secured the right to host a semi-final following their defeat of Valley in trying conditions away from home. Defending 174 for first innings points, the Tigers dismissed a strong Valley outfit for 98. Fraser Haynes, Alex Ward and Matt Dwyer each claimed three wickets in one of the most disciplined displays of fast bowling seen this season. The Tigers were made to face 27 difficult overs in fading light on an inconsistent wicket before the close of play and found themselves 4/37 declared at stumps. Fifth Grade two were defeated outright by Northern Suburbs in the season’s penultimate fixture on Ron Field Oval. The Tigers fell 51 runs short of the total required to avoid outright defeat when they were dismissed for 121 in the second innings. Skipper Matt Wheeler top scored with 28, while Damyn Waddups chipped in with 26. Sixth grade one is also likely to secure a home final following a first-innings victory over the University of Queensland last Sunday. The Tigers piled on 244 runs in response to the visitor’s 117 before taking 5 more opposition wickets for 112 in the second innings. Trent Conwell top scored for Redlands with 54, while skipper Dom Cassell (47) and Scott Butters (32) also made valuable contributions. James Sim (3/24) took the game by the scruff of the neck in the second innings, and in combination with the ever economical Scott Butters (2/10), helped pave the way for a triumphant victory. Sixth Grade two avoided outright defeat to Western Suburbs on a challenging wicket away from home. Requiring 317 for first innings points, Redlands were dismissed for 91 with Aidan Bryant’s 23 the only score of note. The Tigers held on in the afternoon session after being asked to follow-on and were 6/83 at stumps with Will Read (40) the top run scorer.